“Two-Spirit Voices: Returning to the Circle” celebrates the 20th anniversary of Bay Area American Indian Two Spirits (BAAITS), an organization committed to activism and service for the Two-Spirit and ally communities of the San Francisco Bay Area. 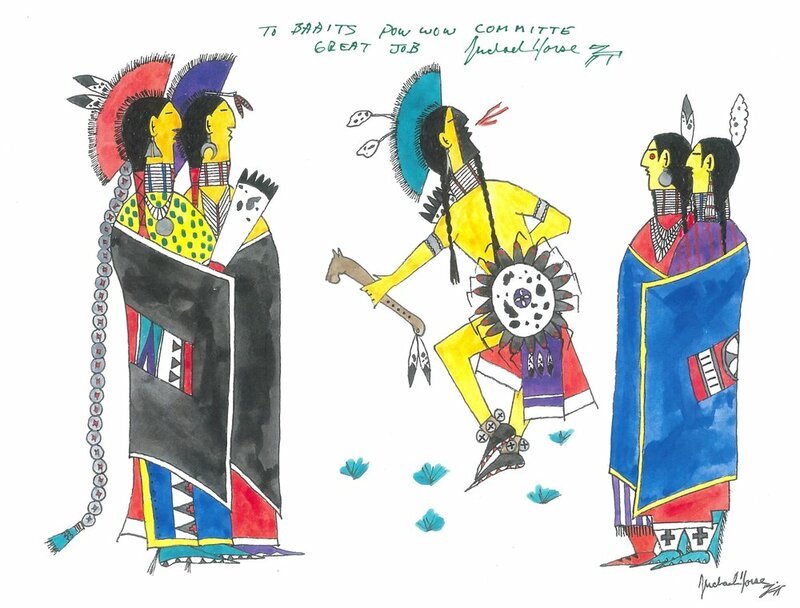 Michael Horse, Artwork for BAAITS’s First Annual Two-Spirit Powwow (2012), used with permission. The exhibition focuses on four main themes: LGBTQ and Two-Spirit pride, the annual Two-Spirit Powwow organized by BAAITS, indigenous medicine and responses to HIV/AIDS, and Two-Spirit meaning within indigenous communities. BAAITS members Roger Kuhn, Amelia Vigil and Ruth Villaseñor have curated the show in collaboration with the GLBT Historical Society. Drawing on materials such as regalia and textiles, medicines and herbs, and photography and video on loan from community members, as well as materials recently donated to the GLBT Historical Society, the exhibition highlights the resiliency of Two-Spirit people in Northern California. Native American themed buttons from the GLBT Historical Society’s Art & Artifacts collection. According to the curators, Two Spirit is translated from the Northern Algonquin word niizh manitoag. The word is used by some American Indian/First Nation communities to signify gender and sexual orientation variance. The term Two Spirit gained popularity in the 1990s after indigenous community leaders offered it as a counterpoint to colonial terminology used by anthropologists and academics to signify practices of nonbinary gender and sexual orientation among the Native peoples of North America. Contemporary American society commonly identifies Two-Spirit people as lesbian, gay, bisexual or transgender. Roger Kuhn is a member of the Poarch Band of Creek Indians. He is a psychotherapist in San Francisco. His worked is informed by social and sexual justice perspectives. A former chair of BAAITS, he is completing a Ph.D. in human sexuality with a focus on decolonizing sexuality. 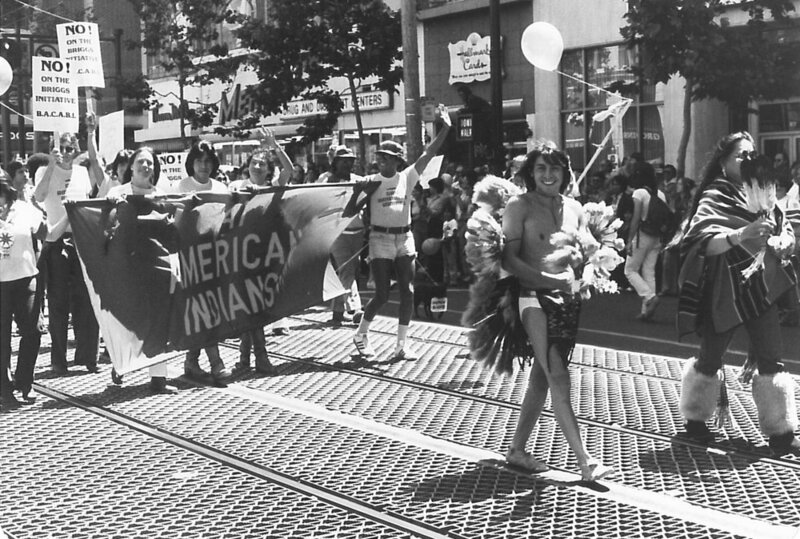 Elaine Gay Jarvis, Gay American Indians contingent in the 1978 Gay Freedom Day parade (1978), Elaine Gay Jarvis Papers (2018-90), GLBT Historical Society. Amelia Vigil is a Two-Spirit and Latinx performance artist, poet and rock climber. Her indigenous heritage is Picuris Pueblo from her father and Purepecha from her mother. She serves as the events and communications manager for Outward Bound California, a nonprofit that promotes outdoor education. A graduate of Mills College in Oakland, Calif., she has been involved with Bay Area American Indian Two Spirits since 2013, joined the board of directors in 2015 and is currently chair of BAAITS. Ruth Villaseñor is a Chiricahua-Apache Mexican woman who identifies as Two Spirit. She has been a member of BAAITS for 19 years. A filmmaker and activist, she was recognized by KQED Public Television in 2003 as a Bay Area Local Hero. Villaseñor co-owns Paws & Claws, a natural pet food store in Oakland, Calif. She serves on the board of BAAITS. Founded in 1998, Bay Area American Indian Two Spirits (BAAITS) exists to restore and recover the role of Two-Spirit people within the American Indian/First Nations community by creating a forum for Two-Spirit spiritual, cultural and artistic expression. BAAITS creates opportunities for Two-Spirit people to socialize, share, network and explore their rich heritage in a safe environment. To that end, the organization is committed to offering culturally relevant activities for LGBTQ individuals of Native American ancestry and their families and friends.